Microbiology « Global Market Insights, Inc.
How have the growth prospects of biotechnology market changed with the contribution of healthcare and biopharma companies? Touted to be one of the most pronounced verticals of the healthcare space, biotechnology market share, as claimed by experts, is all set to soar with numerous growth avenues springing by the day. The industry undeniably deserves credit for having brought forth numerous astounding products that have bolstered the quality of human life and solved integral problems. 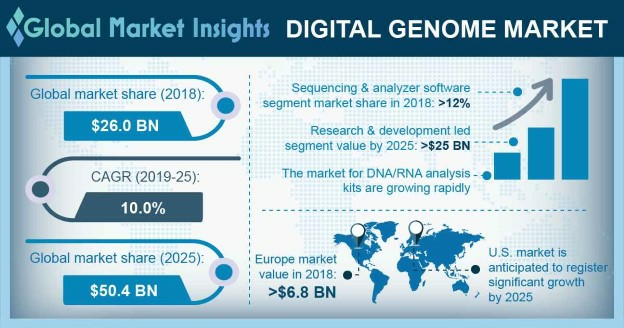 The global biotechnology market is projected to record a highly commendable y-o-y growth rate ahead, owing to the surging incidences of chronic conditions such as cardiac disorders, cancer, diabetes, and others across the globe. Logically speaking, as the burden of these diseases increases it becomes imperative to combat them on scale, and that is where biotechnology comes into play. From genetically modified foods to diagnostic & preventative agents to environmental products and bio-based pest control, biotechnology is ubiquitous and plays a prominent role everywhere. Key players operating in the global biotechnology market are F. Hoffmann-La Roche, Abbott Laboratories, Amgen, Agilent Technologies, BioGen Medical Instruments, PerkinElmer, Danaher, Illumina, Merck, Qiagen, Bio-Rad Laboratories, and Thermo Fisher Scientific. These key players implement strategic initiatives such as new product launch, geographical expansion, mergers and acquisitions to fortify their product suite and boost their standing in the market. A recent instance providing validation to the above claim is of Staten Biotechnology which has entered into a collaboration agreement with Novo Nordisk to jointly develop preclinical dyslipidemia candidate of Staten – STT-5058. Merck, a pharma major, has reportedly signed a licensing contract with Cyclica Incorporation for utilizing Ligand Express, a cloud-powered in silico proteome screening platform. Reportedly, Ligand Express is an AI augmented structural proteome screening platform being used to unleash new targets which are designed to interact with a small molecule. The one year agreement will permit Merck to efficiently and quickly expound mechanisms of action, assess safety profiles, and discover further applications for numerous under-trial small molecules, including those acknowledged in highly disease-related phenotypic screens. Abbott has reportedly exercised its option to acquire Cephea Valve Technologies Incorporation, a medical device maker fabricating a minimally-invasive cardiac valve replacement technology for patients suffering with mitral valve disease. This acquisition would further augment Abbott’s pinnacle position in the therapies market for mitral valve disease, a commonly occurring heart valve disease. In October 2018, Amgen has reportedly publicized that AMGEVITA, an adalimumab biosimilar, will be launched in the European market. Reportedly, AMGEVITA claims that it is the world’s first adalimumab biosimilar to attain approval by the European Commission. AMGEVITA has been authorized for treating inflammatory conditions in adults and pediatric inflammations. AMGEVITA’s launch would cover 28 member countries of the European Union along with Liechtenstein, Iceland, and Norway. Bio-Rad Laboratories Incorporation has reportedly unveiled the NGC Fraction Collector to be used for NGC Chromatography Systems. The NGC platform augments purification efficacy and offers researchers consummate control over the processes. The NGC Fraction Collector enables researchers to elect how to gather and when to address the fractions. Reportedly, the system could be prompted to collect on the basis of pH, buffer percent from pump B, slope, and detector indications. Front-to-back dispensing offers ease of access to fractions before process completion for quicker downstream examination. It operates on ChromLab™ 5.0 Software and ensures no sample loss through auto sample tube calculation. 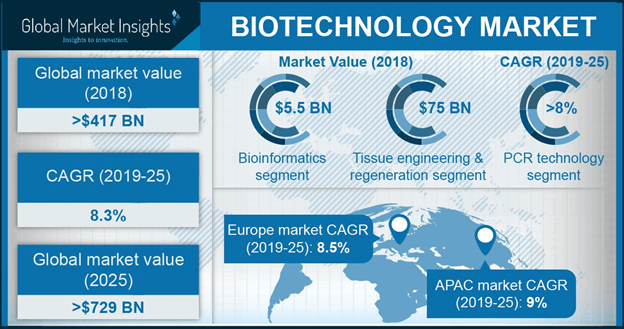 It is thus rather discernible that biotechnology market is on its way to crop up as one of the most prominently remunerative business spheres. The growth projection for the biotechnology industry appears to be rather pronounced in the coming times, given the intensifying commercial consumption of this technology across an array of industries. As per estimates, biotechnology market size is poised to exceed a colossal USD 775 billion by 2024. This entry was posted in Healthcare & Medical Devices and tagged Bioagriculture, Biofuel, Bioindustrial, Biology, Biopharmacy, Bioservices, Biotech, Biotech Industry Growth Forecast, Biotech Market Research, Biotechnology Engineering, Biotechnology Industry Growth Rate, Biotechnology Industry Overview, Biotechnology Market News, Biotechnology Market Research, Biotechnology Market Research Reports, Biotechnology Market Segmentation, Biotechnology Market Share, Biotechnology Market Size, Biotechnology Market Strategies, Biotechnology Market Trends, Cell Based Assay, Chromatograpgy, DNA Sequence, DNA Sequencing, Fermentation, Global Biotechnology Market, Global Biotechnology Market Research, Microbiology, Nanobiotechnology, PCR Technology, Recombinant Technology, Synthetic Biology, Tissue Engineering, Tissue Regeneration, White Biotechnology Market.